A black and insoluble biopolymer called eumelanin and other types of melanin together determine skin and hair color, particularly for dark phenotypes. Eumelanin is also a soft, biocompatible nanomaterial with technological potential. However, previous studies of this substance have primarily been carried out with synthetic samples. In the journal Angewandte Chemie, Italian researchers have now revealed why natural eumelanin is significantly superior to the synthetic version as a radical scavenger, antioxidant, and photo-protectant. Thanks to its unusual optoelectronic, dielectric, metal-binding, and radical-scavenging properties, eumelanin could be useful for a variety of technical applications, including organic electronic components or antioxidants for plastics. However, it was recently discovered that the properties of synthetic eumelanin are significantly different from those of the natural product. Seeking better insight into chronic fatigue syndrome, a new brain scan investigation has pinpointed what could be the first evidence of a connection between nerve cell inflammation and the onset of this debilitating and somewhat mysterious illness, researchers say. I came across this article in JACS recently. I remember using chlorine gas myself and being a little trepidacious with it. It is a nasty gas to deal with. I had to remember to clean out the regulator after every use so it didn’t corrode and make it difficult to close at the most inopportune time. I used thionyl chloride a lot and that had a tendency to wreak havoc on my Rotovap at the time. Not nice stuff. Anyways. As an eagerly-anticipated debate kicks off at the American Thoracic Society conference in San Diego on drugs for idiopathic pulmonary fibrosis, Boehringer Ingelheim has posted promising late-stage data on its offering, nintedanib. Nintedanib, a triple angiokinase inhibitor, is currently being evaluated against advanced HCC in phase I/II clinical trials. Here, we report the underlying molecular mechanism by which nintedanib (BIBF-1120) induces an anti-HCC effect. 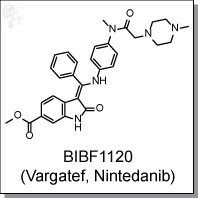 Nintedanib (formerly BIBF 1120; trade name Vargatef) is a small molecule of angiokinase inhibitor class inhibiting vascular endothelial growth factor receptor (VEGFR), fibroblast growth factor receptor (FGFR) and platelet derived growth factor receptor(PDGFR) being developed by Boehringer Ingelheim for use as an anti-vascular anti-cancer agent. Nintedanib is an indolinone-derived drug that inhibits the process of blood vessel formation (angiogenesis) in tumours. Angiogenesis inhibitors stop the formation and reshaping of blood vessels in and around tumours, which reduces the tumour’s blood supply, starving tumour cells of oxygen and nutrients leading to cell death and tumour shrinkage. Unlike conventional anti-cancer chemotherapy which has a direct cell killing effect on cancer cells, angiogenesis inhibitors starve the tumour cells of oxygen and nutrients which results in tumour cell death. One of the advantages of this method of anti-cancer therapy is that it is more specific than conventional chemotherapy agents, therefore results in fewer and less severe side effects than conventional chemotherapy. Preclinical studies have shown that nintedanib binds in a highly selective manner to the ATP binding domain of its three target receptors, without binding to similarly shaped ATP domains in other proteins, which reduces the potential for undesirable side effects. Nintedanib is currently undergoing investigation in phase II and III clinical trials and is yet to be licensed by the FDA. Angiogenesis inhibitors such as nintedanib may be effective in a range of solid tumour types including; lung, ovarian, metastatic bowel, liver and brain cancer. Several further phase I and II clinical trials with nintedanib are underway. Patients are also being recruited for three phase III clinical trials that will evaluate the potential benefit of nintedanib when added to existing 1st line treatments in patients with ovarian. and 2nd line treatment in non-small cell lung cancer  The phase III trials of nintedanib in lung cancer have been named LUME-Lung 1 and LUME-Lung 2. A phase III clinical trial is also underway examining the safety and efficacy of nintedanib on patients with the non-cancerous lung condition idiopathic pulmonary fibrosis. Hilberg, F.; U. Tontsch-Grunt, F. Colbatzky, A. Heckel, R. Lotz, J.C.A. van Meel, G.J. Roth (2004). “BIBF1120 a novel, small molecule triple angiokinase inhibitor: profiling as a clinical candidate for cancer therapy”. European Journal of Cancer Supplements 2(50). Reck, M.; R. Kaiser, C. Eschbach, M. Stefanic, J. Love, U. Gatzemeier, P. Stopfer, J. von Pawel (2011). “A phase II double-blind study to investigate efficacy and safety of two doses of the triple angiokinase inhibitor BIBF 1120 in patients with relapsed advanced non-small-cell lung cancer”. Ann Oncol. ISSN 1569-8041. Mross, K.; M. Stefanic, D. Gmehling, A. Frost, F. Baas, C. Unger, R. Strecker, J. Henning, B. Gaschler-Markefski, P. Stopfer, L. de Rossi, R. Kaiser (2010). “Phase I study of the angiogenesis inhibitor BIBF 1120 in patients with advanced solid tumors”.Clin Cancer Res 16 (1): 311–9. doi:10.1158/1078-0432.CCR-09-0694. ISSN 1078-0432. PMID 20028771. Kropff, M.; J. Kienast, G. Bisping, W. E. Berdel, B. Gaschler-Markefski, P. Stopfer, M. Stefanic, G. Munzert (2009). “An open-label dose-escalation study of BIBF 1120 in patients with relapsed or refractory multiple myeloma”. Anticancer Res 29 (10): 4233–8.ISSN 1791-7530. PMID 19846979. Ellis, P. M.; R. Kaiser, Y. Zhao, P. Stopfer, S. Gyorffy, N. Hanna (2010). “Phase I open-label study of continuous treatment with BIBF 1120, a triple angiokinase inhibitor, and pemetrexed in pretreated non-small cell lung cancer patients”. Clin Cancer Res 16 (10): 2881–9. doi:10.1158/1078-0432.CCR-09-2944. ISSN 1078-0432.PMID 20460487.
du Bois, A.; J. Huober, P. Stopfer, J. Pfisterer, P. Wimberger, S. Loibl, V. L. Reichardt, P. Harter (2010). “A phase I open-label dose-escalation study of oral BIBF 1120 combined with standard paclitaxel and carboplatin in patients with advanced gynecological malignancies”. Ann Oncol 21 (2): 370–5. doi:10.1093/annonc/mdp506.ISSN 1569-8041. PMID 19889612. Xiang, Q. F.; F. Wang, X. D. Su, Y. J. Liang, L. S. Zheng, Y. J. Mi, W. Q. Chen, L. W. Fu (2011). “Effect of BIBF 1120 on reversal of ABCB1-mediated multidrug resistance”.Cell Oncol (Dordr) 34 (1): 33–44. doi:10.1007/s13402-010-0003-7. ISSN 2211-3436. Harvard Stem Cell Institute (HSCI) scientists at Massachusetts General Hospital have a potential solution for how to more effectively kill tumor cells using cancer-killing viruses. The investigators report that trapping virus-loaded stem cells in a gel and applying them to tumors significantly improved survival in mice with glioblastoma multiform, the most common brain tumor in human adults and also the most difficult to treat. The work, led by Khalid Shah, MS, PhD, an HSCI Principal Faculty member, is published in the Journal of the National Cancer Institute. Shah heads the Molecular Neurotherapy and Imaging Laboratory at Massachusetts General Hospital. A combination of the myxoma virus and the immune suppressant rapamycin can kill glioblastoma multiforme, the most common and deadliest malignant brain tumor, according to Moffitt Cancer Center research. Peter A. Forsyth, M.D., of Moffitt’s Neuro-Oncology Program, says the combination has been shown to infect and kill both brain cancer stem cells and differentiated compartments of glioblastoma multiforme. The finding means that barriers to treating the disease, such as resistance to the drug temozolomide, may be overcome. The study, by Forsyth and colleagues in Canada, Texas and Florida, appeared in a recent issue ofNeuro-Oncology. Last week, GEN (Genetic Engineering & Biotechnology News), publishes an online list of the top 18 best-selling drugs that are launched in 2013, for those companies who provide 2013 sales information.